In 2017, craft brewer Joseph Ackerman met the owners of the recently-opened Sidetracked Taproom at a tap takeover event. They stayed in touch, and several months later asked for his help in adding on a brewery. Joseph jumped at the chance to work in Morganton, where he and his family have a church family and good friends. He came on as head brewer and began building the brewhouse in January 2018. In March Sidetracked offered its first handcrafted beer on tap. That spring, the owners offered to sell the business to Joseph. Recognizing this as the opportunity to realize a lifelong dream, Joseph and his wife Jessica prayed and pursued funding with the help of advisors. Within 24 days, they had all the investors they needed. 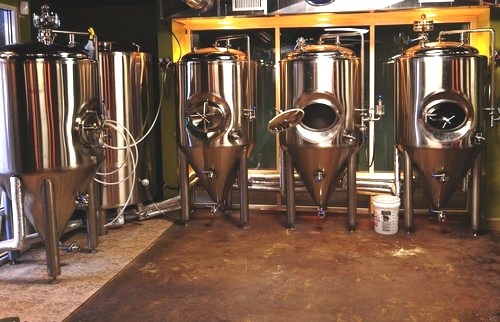 Having previously worked for two production breweries, Joseph realized that managing an operation that size took him away from his true passion: brewing good beers and connecting with the people who love them. He took on ownership of Sidetracked with a different vision. Sidetracked is about PASSION. Craft brewing is a lifelong pursuit of knowledge, skill, and creativity. Our classic beers are world-class examples of their styles, the finest available anywhere. Our experimental beers are fun and quirky, formulated using both ancient and modern techniques. Sidetracked is about ART. Our artisanal products reflect the beauty and history of our place. We offer libations with excellent aesthetics, aroma, and taste. And we create a space where everyone can enjoy the good, the refreshing, and the tasteful. Sidetracked is about COMMUNITY. We love our little town nestled in the North Carolina mountains. For us, Morganton is the last stop. We are a small business based on local relationships, and we keep our beers on tap and in town. We welcome guests with free popcorn, games, events, and a cozy taproom that is kid-friendly, pet-friendly, and people-friendly. Come in and stop a spell. Get sidetracked with us.